Personal information is like money. Value it. Protect it. 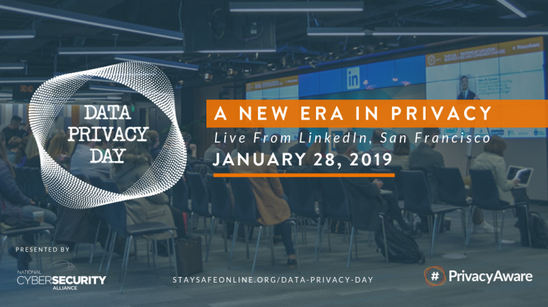 Respecting Privacy, Safeguarding Data and Enabling Trust is the theme for Data Privacy Day, January 28. As an official 2019 Data Privacy Day champion, McGill is spreading the word with articles, tweets and links to live events. Data Privacy Day is an international effort which began in the United States and Canada in January 2008 as an extension of the Data Protection Day celebration in Europe. Data Protection Day commemorates the January 28, 1981 signing of Convention 108, the first legally binding international treaty dealing with privacy and data protection. The Data Privacy Day campaign is officially led by the National Cyber Security Alliance (NCSA). #ChatSTC Twitter Chat: Online Privacy – What’s the Big Deal? Thursday, January 17, 3-4 p.m. The more information you make public about yourself (and your friends and family), the greater your exposure to online threats such as identity theft, cyber-stalking and cyber-bullying. Here are some simple tips on how to protect your online information, identity and privacy. PERSONAL INFO IS LIKE MONEY: VALUE IT. PROTECT IT. Information about you, such as your purchase history or location, has value – just like money. Be thoughtful about who gets that information and how it’s collected through apps and websites. You should delete unused apps, keep others current and review app permissions. Think before posting about yourself and others online. Consider what it reveals, who might see it and how it could be perceived now and in the future. It’s a good idea to review your social network friends and all contact lists to ensure everyone is still relevant. Set the privacy and security settings on websites and apps to your comfort level for information sharing. Each device, application or browser you use will have different features to limit how and with whom you share information. Your usernames and passwords are not enough to protect key accounts like email, banking and social media. Choose one account and turn on the strongest authentication tools available, such as biometrics, security keys or a unique one-time code sent to your mobile device. NOTE: We will soon be introducing two-factor authentication to your McGill account. Stay tuned for upcoming announcements. Keep all software, operating systems (mobile and PC) and apps up to date to protect data loss from infections and malware. APPLY THE GOLDEN RULE ONLINE. Post only about others as you would have them post about you. Every device should be secured by a password or strong authentication – finger swipe, facial recognition etc. These security measures limit access to authorized users only and protect your information if devices are lost or stolen. Information about you, such as the games you like to play, your contacts list, where you shop and your location, has tremendous value. Be thoughtful about who gets that information and understand how it’s collected through apps. These tips are provided courtesy of StaySafeOnline.org. Note: StaySafeOnline.org is an American website that references American privacy laws. Keep in mind that privacy laws in Canada are different from those in the US. However, for the general public, best practices and the dangers associated with privacy remain the same. For further information regarding Canadian privacy laws, please refer to the Office of the Privacy Commissioner of Canada website.